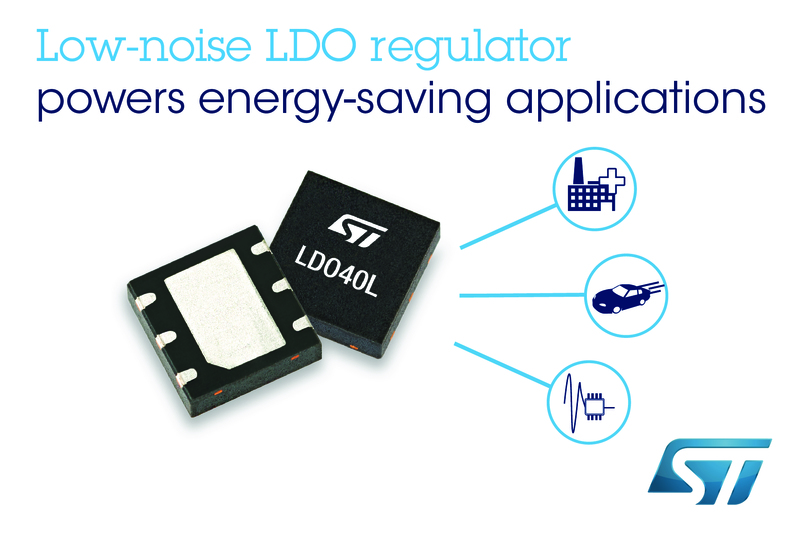 Geneva, December 6, 2018 -- The STMicroelectronics LDO40L 400mA low-dropout linear regulator delivers quiet and efficient power for always-on automotive modules and noise-sensitive loads. With 45µA quiescent current, the AEC-Q100 qualified LDO40L reduces the demand on vehicle batteries to run loads such as body and interior functions that are active when the ignition is off. In addition, the device can be disabled to achieve a very-low shutdown current of only 1µA. The internal circuity operates from an input voltage as low as 3.5V and combined with the extremely low dropout voltage of 36mV at 100mA load, or 140mV at full load, they enable the LDO40L to maintain power to the load as the input dips during cold cranking. In addition to powering automotive body-control modules, instruments and clusters, and LED lighting, the LDO40L also ensures stable, high-quality DC for industrial controls and building- or home-automation applications. Output noise is just 20µV, power-supply rejection ratio (PSRR) 70dB @1kHz, and protection features including current limit and thermal shutdown are built-in. The device variants give a choice of fixed 3.0V, 3.3V, 5.0V or 8.5V output voltage, regulated within ±3% including line, load and temperature variation. Only two capacitors are needed to complete the application circuit. An adjustable-output version is also available, which allows designers to set a desired output voltage down to 2.5V minimum using an external resistor divider. All versions are housed in a 3mm x 3mm DFN6 package with wettable flanks, which is smaller than the DPAK outline of typical competing devices yet maintains high thermal performance and excellent reliability in relation to heatsink size. The LDO40L series is in full production now, priced from $0.62 for orders of 1000 pieces. Please visit www.st.com/ldo40l-pr for further information.